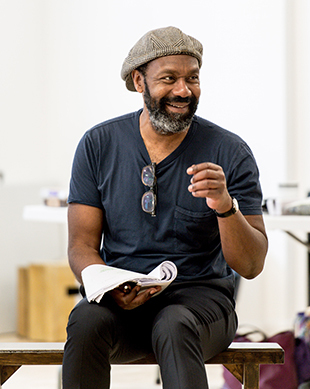 Actor, writer, broadcaster and comedian Lenny Henry discusses his wide-ranging career as he embarks on a major new stage production of Educating Rita at Chichester Festival Theatre. You’ve described Educating Rita as ‘a Rolls Royce play’. Why do you think it continues to resonate with so many people, 35 years after its first production? What appeals to you about the role of Frank, the Open University lecturer who’s tutoring Rita? It’s a great role; Frank was a poet but sacrificed his art for a lecturing job at the local university. He feels that he has abandoned his muse for a pay cheque –and has descended into a routine of drinking and moaning. Enter Rita, and with her chaos! He has to cope with a growing realisation that actually the prospect of a mature student needn’t be onerous at all. The growing connection between them as the play develops is a joy to play. Educating Rita is an incredibly inspirational play; the relationship between Frank and Rita is beautifully calibrated – like fine engineering. What qualities do you think Lashana Lynch will bring to the role of Rita? Lashana is a phenomenal actor; she has a fabulous ear for dialect and also razor-sharp timing. Her role as Tybalt in Romeo and Juliet at the National Theatre’s Shed and also her whip-smart cameo in Fast Girls display the range of her talent to an extent. Rita will give people a pretty good idea of what she is capable. Lashana rocks. You’ve described gaining a university degree as a pivotal moment in your life. What led you to embark on an OU course when you’d already established a successful career? I left Blue Coat Secondary Modern with hardly any qualifications. My mother had wanted me to complete my education so that I had ‘something to fall back on’ – by the time I’d left school, entered the world of showbusiness and leap frogged the nightmare that was The Black and White Minstrel Show (from 1975 to 1981), I was reading voraciously and eventually decided to enrol with W.R. Tuson college for a GCSE course in English Literature and Comprehension. Cut to 1998 – and the passing of my mother, plus my role as the Superhead in Hope and Glory helped me to make the decision to embark on an Open University BA Hons course. It took six years. I loved almost every minute of it and have never regretted the time spent in my office or on the train or at the British Library studying like Bill Gates with an exam looming. I think it’s helped me in terms of stating my case, debating, arguing and speaking with my own voice. Also – it gave me an appreciation of Shakespeare that I perhaps hadn’t had before. You’ve embraced the challenge of moving from stand-up and TV comedy to demanding theatrical roles. What is it that you enjoy about working in theatre? Stand-up is a lonely art – the rewards are great of course, but you’re pretty much on your own. I’d been doing it since I was 16 and I wanted a change - thankfully because I’m self- employed and have empathic management, I was able to follow my dreams. Have you worked with Michael Buffong before? How would you sum up his qualities as a director? I loved Michael’s production of Moon on a Rainbow Shawl by Errol John at the National Theatre. I made a point of getting in touch with him after that show. You’re developing a project with Michael about one of your heroes, the comedian Richard Pryor. Apart from Pryor, who else has inspired or influenced you? You’re joining a panel of young people for CFT’s Youth Get In! event. Is there one piece of advice you’d give to anyone who wants a career in the arts? Congratulations on your recent Broadcasting Press Guild Award for championing the need for more diversity in the Arts. Why has this campaign been so important to you? 2015 is a particularly busy year for you! What other projects are you working on? I’m part of the ensemble that makes up The Syndicate 3 – a new television series written and (partly) directed by Kay Mellor – it’s that great show about a group of people that win the lottery and everything happens to them as a result. I play Godfrey Watson, the landscape gardener and general dogsbody at a run down stately home in Yorkshire. I’ve also written my first green lit screenplay – it’s called Danny and the Human Zoo and it’s filming even as I write this –it’s directed by Destiny Ekaragha (Gone Too Far) and stars Kascion Franklin. It’s a fantasy memoir about my first two years in showbusiness. I have made a documentary for Sky Arts called When Lenny Got the Blues – which is an exploration of the British blues explosion of the late 50s/early 60s – we talk to some of the people involved, everyone from Paul Jones, to Van Morrison, to Geno Washington – and talk to them about how come there weren’t any black British blues singers? I also get to launch my own blues band on the show. Best play you’ve seen this year? A View From a Bridge featuring Mark Strong, also Gypsy with Imelda Staunton – stunning. Mark Strong was brilliant in View From a Bridge and Olivia Colman always makes me cry. I love MasterChef. Bring back Ping!